1. Rather than try to fix your body, focus on how you want it to feel. 2. The mark of true confidence is the ability to look someone in the eye. 3. Let the seasons guide your diet. The Earth grows what you need, when you need it. 4. Respect your feet. They’ve mastered the art of staying grounded while moving forward. 5. Take charge of your own reflection: Stop letting the mirror win. 6. Enlightenment doesn’t always make a grand entrance. It slowly transforms the ordinary into the extraordinary. 7. Change happens somewhere between the acceptance of now and the anticipation of what’s to come. 8. Don’t obsess over weight loss. Wellness is about making your life bigger, not smaller. 9. Surprise yourself: Push past your physical limits. 10. Nothing connects you to who you are quite like the people who knew you when. 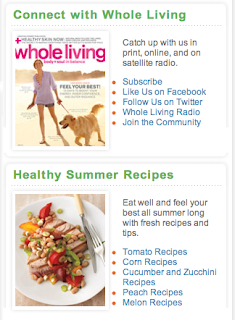 Check out more tips, information and inspiration for your body and soul on Whole Living Magazine or visit Whole Living.com. What's in this 500 calories of healthy yumminess?